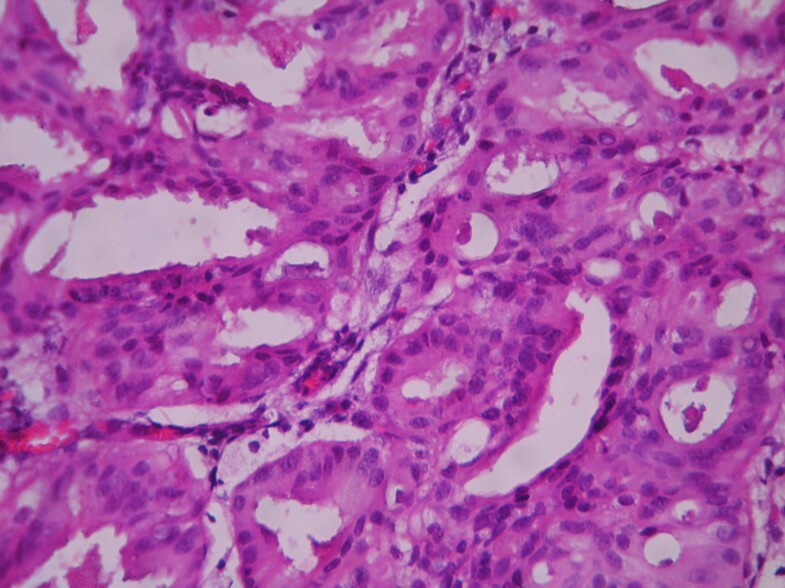 Management of endometrial precancerous lesions has been of much debate due to inconsistencies in their classification, natural history and histologic diagnosis. 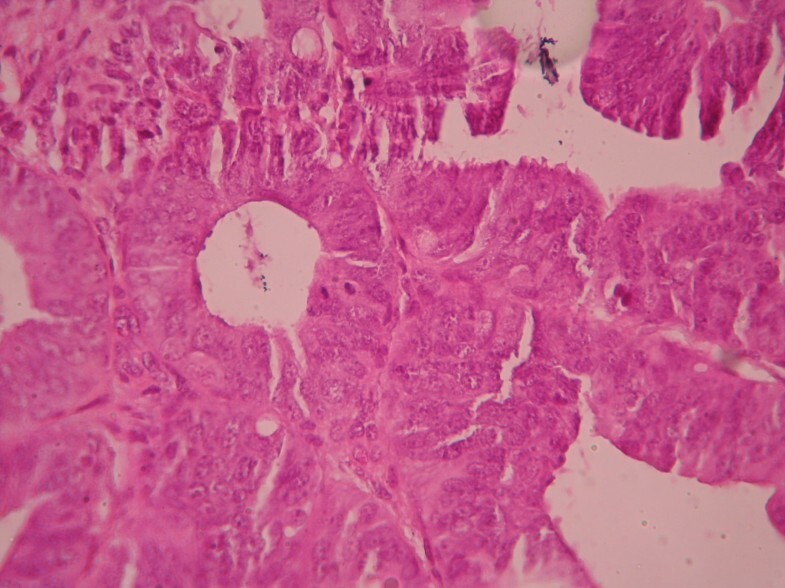 Endometrial hyperplasia constitutes a wide range of histomorphologic features associated with high intra and interobserver diagnostic variability. Although traditional microscopic diagnosis is by far the most applicable method and the gold standard for histomorphologic diagnosis, digitized image analysis has been used as a powerful adjunct to maximize the histologic data retrieval and to add some detailed objective criteria for correct diagnosis in difficult cases. A series of 100 endometrial curettage specimens with diagnosis of endometrial hyperplasia or well differentiated adenocarcinoma were blindly reviewed by 5 pathologists; their intra and interobserver reproducibility determined and further compared to the objective morphometric data i.e. D-score and volume percent of stroma (VPS). The results were assessed using the weighted kappa statistics. Mean intraobserver kappa value was 0.8690 (99.44% agreement). Mean interobserver kappa values by diagnostic category were: simple hyperplasia without atypia: 0.7441; complex hyperplasia without atypia: 0.3379; atypical hyperplasia: 0.3473, and well-differentiated endometrioid carcinoma: 0.6428; with a kappa value of 0.5372 for all cases combined. 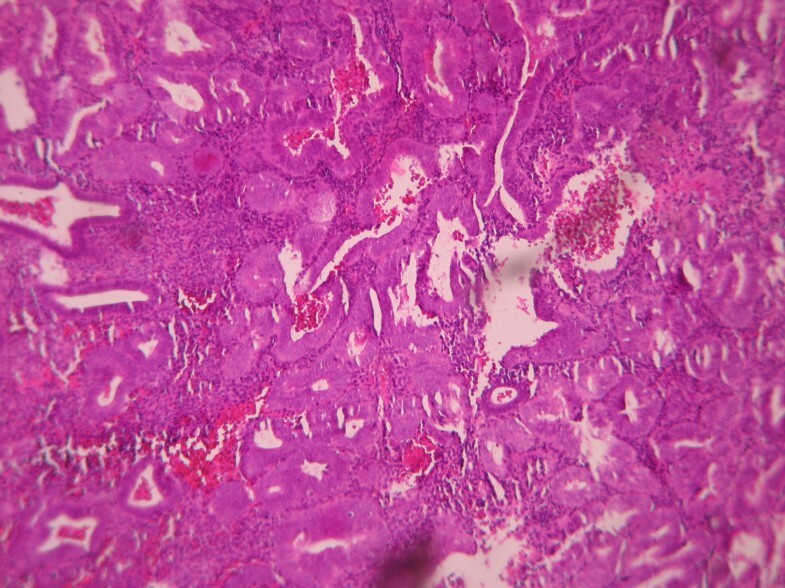 Interobserver agreement was in substantial rate for simple hyperplasia (SH) and well differentiated adenocarcinoma (WDA) but was in fair limit for complex hyperplasia (CH) and atypical hyperplasia (AH). Intraobserver agreement was almost perfect. The specimens were divided in two groups according to the computerized morphometric analysis: Endometrial Hyperplasia (EH) ( D Score ≥ 1 or VPS ≥ 55%) and Endometrial Intraepithelial Neoplasia (EIN) (D-Score < 1 or VPS < 55%). Morphometric findings were closely compatible with routine WHO classification made by one expert pathologist; however; diagnosis of (CH) and (AH) made by other pathologists were not concordant with morphometric data. It may be necessary to make some revisions in WHO classification for endometrial hyperplasia and precancerous lesions. A retrospective review of the archives of the Department of Pathology of Mirza Kolchak Khan Hospital, for the period of 2001 through 2005 identified 100 patients who had D&C specimens diagnosed as endometrial hyperplasia and well differentiated adenocarcinoma. The material was fixed in buffered formaldehyde, embedded in paraffin wax and standard hematoxylin eosin (H&E) stained histological sections were made. Five pathologists with varying experiences in the field of gynecologic pathology who worked at hospitals in Tehran University of medical sciences contributed to this study. The cases were selected to represent four diagnostic categories including simple hyperplasia(SH) which shows glands are irregular in size and shape with occasional dilated, cystic glands lined by pseudostratified uniform and oval nuclei showing orientation toward the basement membrane and separated by abundant stroma (fig 1 and 2), complex hyperplasia(CH) composed of closely spaced glands, highly irregular in size and shape with pseudostratified uniform and oval nuclei (fig 3 and 4), atypical hyperplasia(AH), a complex hyperplasia which cells show atypia including irregular, stratified, rounded nuclei with nucleoli (fig 5 and 6) and well differentiated adenocarcinoma(WDA), when there are confluent glandular pattern, an extensive papillary pattern, cribriform bridging, desmoplastic or granulation tissue like stroma, and highly atypical cells (fig 7 and 8, 9 and 10, 11 and 12, 13 and 14). Simple hyperplasia. 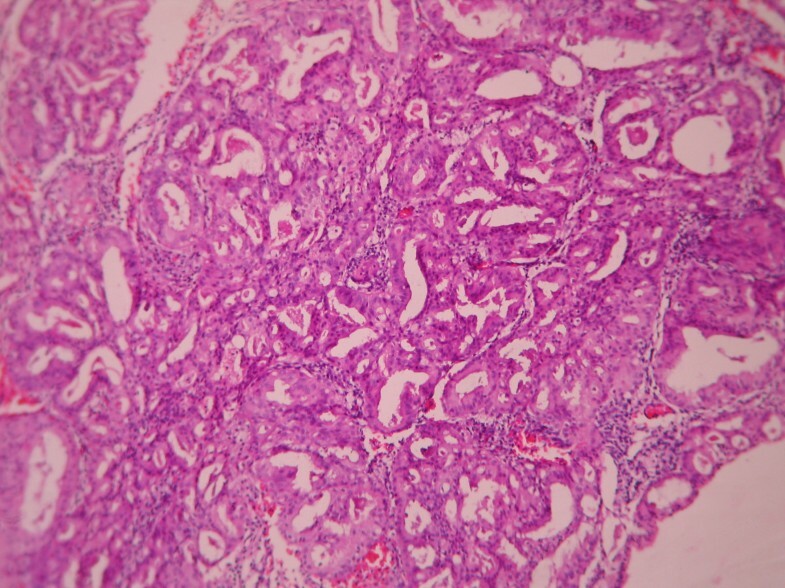 Glands are in various size with occasional dilated, cystic glands separated by abundant stroma. (Low power). Simple hyperplasia. 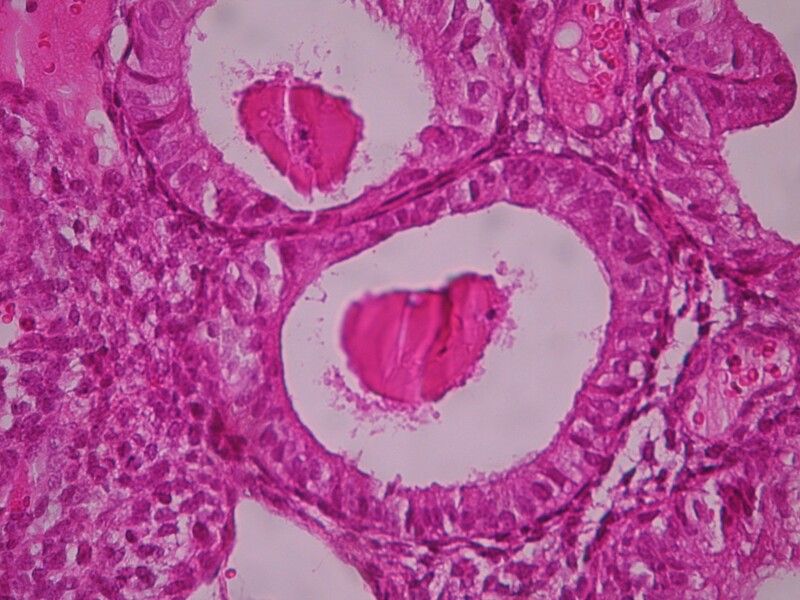 Glands are lined by pseudostratified uniform and oval nuclei. (High power). 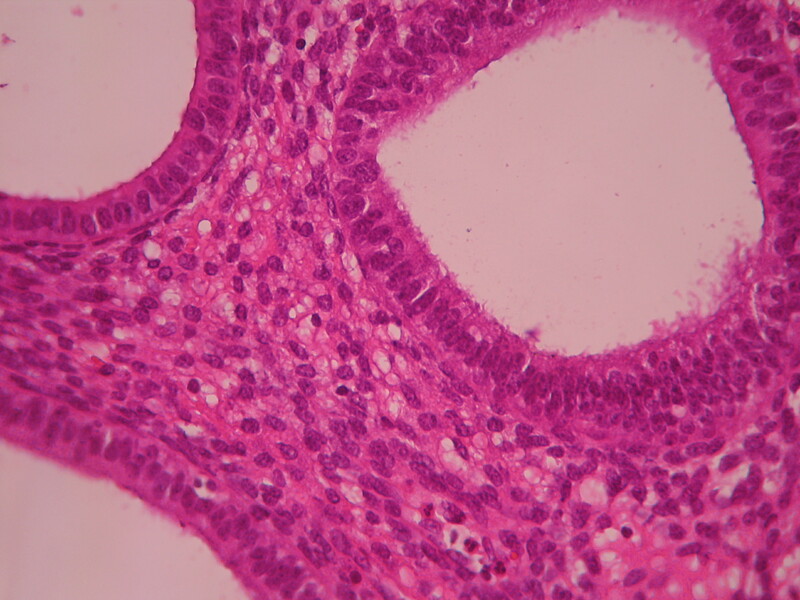 Complex hyperplasia. The glands are closely back to back with scant intervening stroma and highly irregular in size and shape. (Low power). 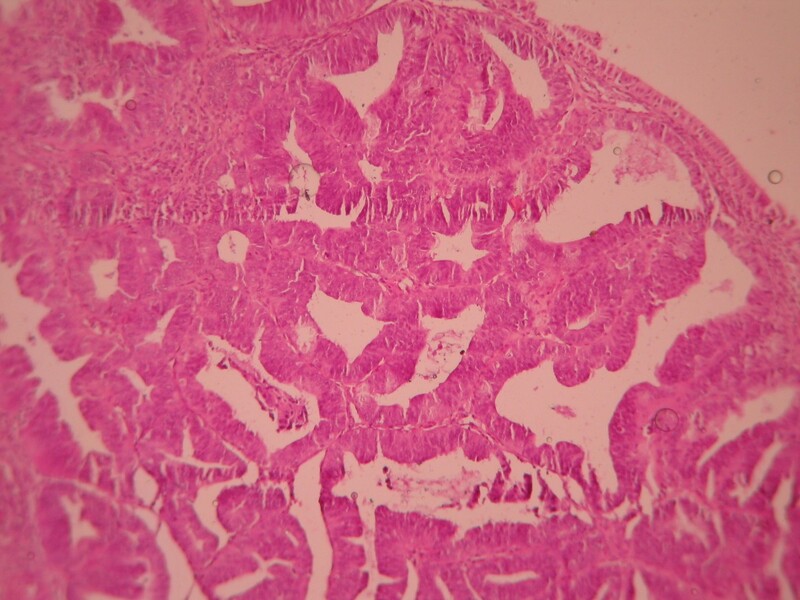 Complex hyperplasia. The glands are separated by scant endometrial stroma from each other. The nuclei are uniform and oval. (High power). Atypical hyperplasia. The glands are closely back to back with scant intervening stroma and highly irregular in size and shape. (low power). Atypical hyperplasia. Back to back glands show stratified round nuclei with nucleoli. (High power). 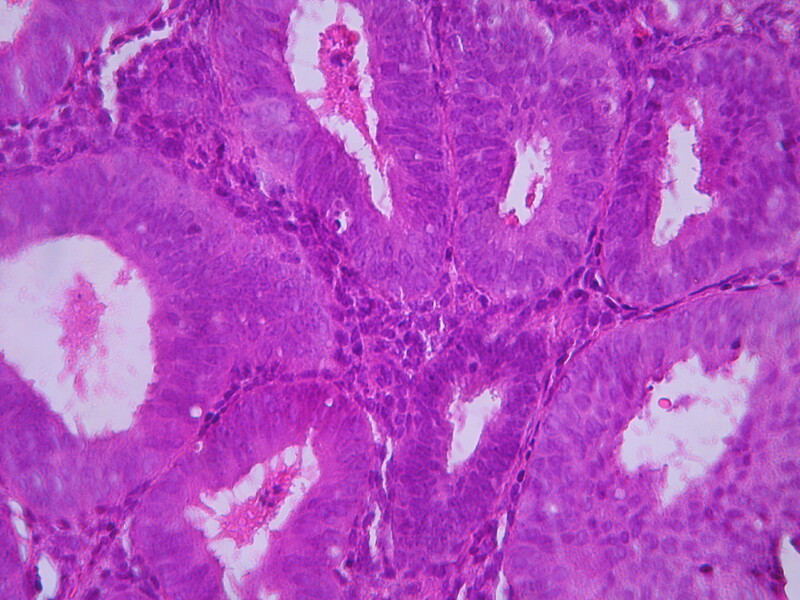 Endometrial adenocarcinoma. Closely back to back glands without intervening endometrial stroma and with granulation tissue like stroma and cribriform pattern. (Low power). Endometrial adenocarcinoma. 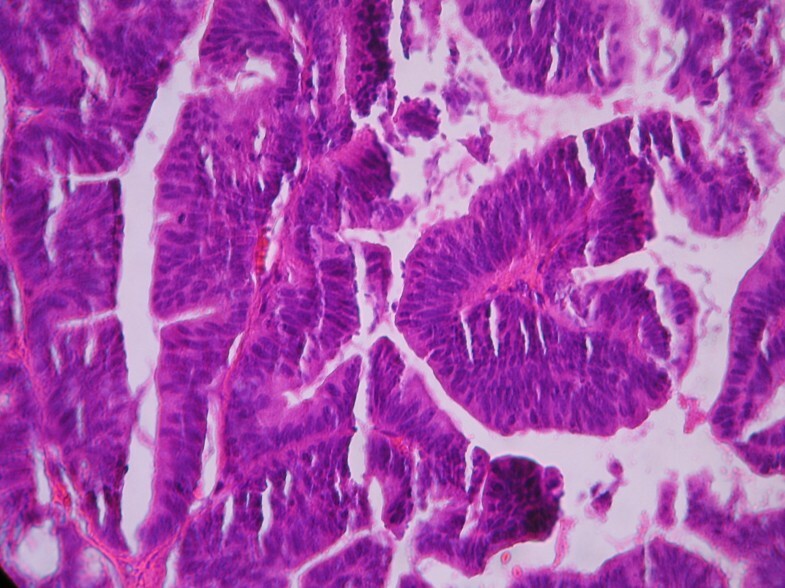 Confluent growth pattern of glands with no intervening endometrial stroma or loose granulation tissue like stroma. (High power). 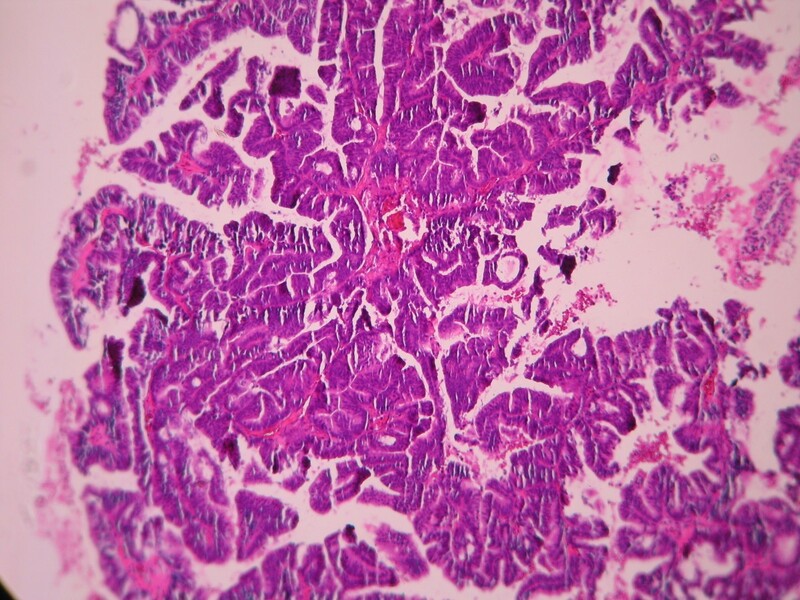 Endometrial adenocarcinoma. 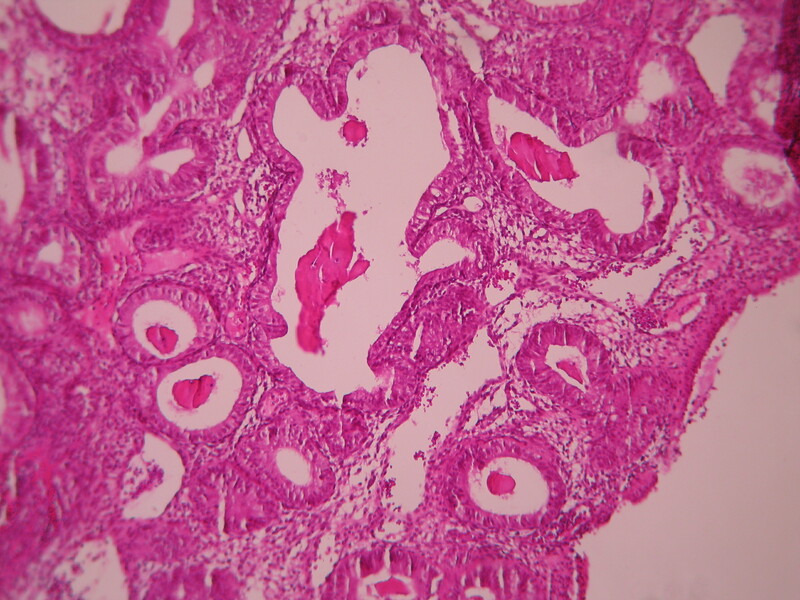 Confluent growth pattern of glands with no intervening endometrial stroma. (Low power). 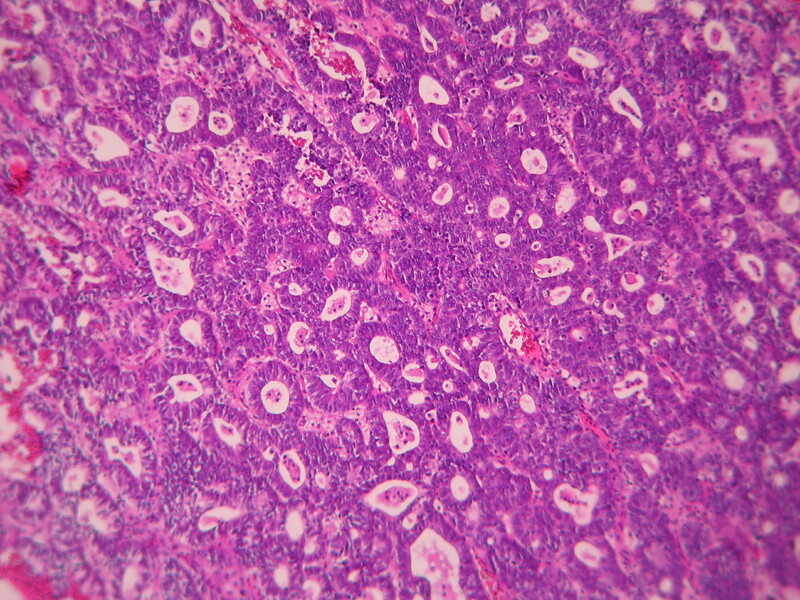 Endometrial adenocarcinoma. 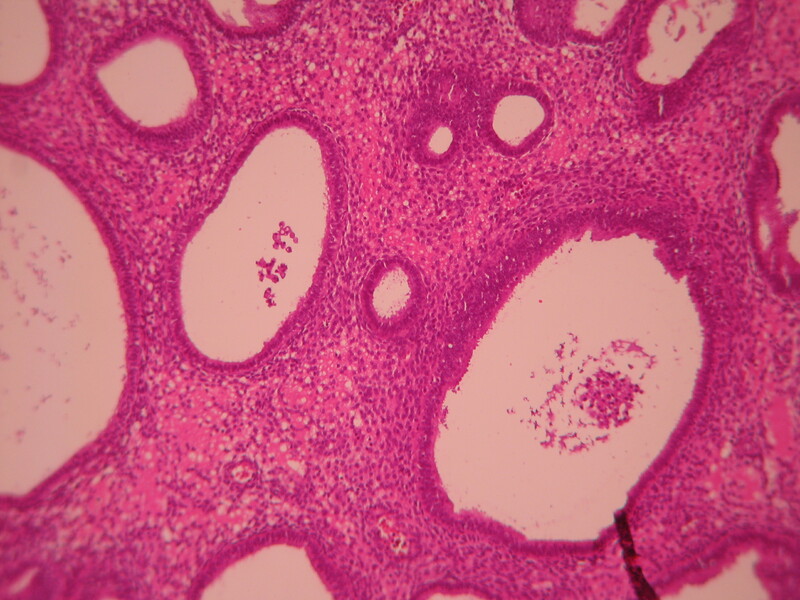 Confluent growth pattern of glands with no intervening endometrial stroma and severe nuclear atypia. (High power). 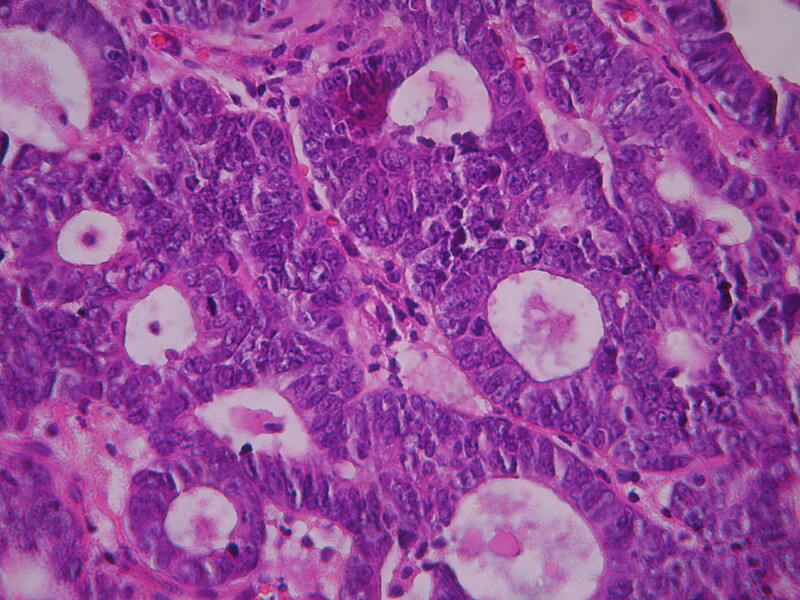 Endometrial adenocarcinoma. Cribriform pattern of glands. (Low power). Twenty-five cases from each category were included and one representative H&E slide was selected of each case. To assess interobserver variability slides were randomly labeled from 1 to 100, evaluated by 5 pathologists and presumptive diagnoses were recorded in a checklist. For intraobserver evaluation one expert gynecopathologist examined all of the slides twice within a period of two months. analysis is about 80%,  so 55 out of 100 H&E slides were selected randomly which yielded appropriate material for morphometric analysis. Computerized morphometric analysis of delineated regions on H&E stained sections was performed using the Leica IM 500® (V.4.R117) software incorporated into the digitized light-microscope. [3–5, 14] Measurement of these features performed on 9–11 images taken from the most representative hyperplastic areas in H & E stained sections with a minimum size of 1 mm and careful exclusion of mimics and non hyperplastic areas [7, 14]. Values of D-Score ≥ 1 or VPS ≥ 55% were defined as one group and D-Score<1 or VPS<55% defined as the other. Table 2, lists intraobserver agreement of the expert gynecopathologist on two separate diagnostic rounds. Kappa results show significant agreement in all diagnostic groups. After pathologist agreement assessment, mean difference of computerized morphometric data (VPS and D-Score) with pathologist diagnosis subgroup, statistically analyzed with post HOC test and shuffle exam for three pathologists. Compared assessment of different diagnostic groups with D-Score results show high concordance and ability in O1t1 (Observer 1 Time 1) for classification and differentiation of endometrial hyperplasia subgroups but overlapping results in differentiation of CH with AH and AH with WDA groups in O2t1 (Observer 2 Time 1) and CH with AH in O3t1 (Observer 3 Time 1). Case by case comparison of computerized VPS (cut-off range 55%) and D-Score (cut-off range 1) with pathologist diagnosis in four diagnostic variables analyzed with kruss-kall Wallis test are shown in tables 3 and 4. SH: Simple Hyperplasia, CH: Complex Hyperplasia, AH: Atypical Hyperplasia, WDA: Well Differentiated Adenocarcinoma. The WHO 94 endometrial hyperplasia classification system will continue to play an active role in the daily practice of many pathologists but is plagued by poor diagnostic reproducibility and the lack of a solid statistical foundation on therapeutic context. Considering the combined interobserver agreement level of "moderate" attained in this study and the previously reported results as "fair" by Skov (1997); "substantial" by Kendall (1998) and "moderate" by Bergeron(1999) it seems that WHO 94 classification system needs essential improvements by an entirely new approach rather than minor revisions. [16–18]EIN classification system (EH-EIN-CA) is the best documented alternative based on extensive morphological, genetic molecular and clinical outcome data. One with high concordance and 95% rate of confidence interval in all subgroups but those two others with overlapping results, especially in diagnoses of CH with AH that show lowest rate of reproducibility in all studies. Compared VPS and D-Score results rendered highly concordant replicate results. Case by case comparison of VPS (cut-off range 55%) and computerized D-Score (cut-off range 1) with pathologist diagnosis is shown in tables 3 and 4. As the histological diagnosis goes from benign (SH) to malignant (WDA) the VPS decreases to <55% and D-Score becomes <1; however; there is a major difference between 3 pathologists in CH category. In other words, the second and the third pathologists (O2 and O3) have probably "under diagnosed" a premalignant or even malignant lesion as CH. This may result in substantially divergent guidance to the gynecologist and incorrect management such as medical therapy instead of hysterectomy. In conclusion, diagnosis of endometrial hyperplasia and carcinoma with WHO-defined nomenclature may be problematic, mainly due to stylistic differences between individuals and inherent poor reproducibility of the broad range of diagnoses from benign to malignant. Limitation of borderline or precancerous lesions into one category (EIN) recognized by objective morphometry will probably simplify the diagnosis and improve the patient's management. Measurement of VPS – by far the most predictive component of the D-score – can be accomplished simply by applying an inexpensive ocular grid into an ordinary microscope eyepiece and counting the specified points on glandular and stromal components. NIM is study designer, contributed in histological diagnosis and writing of manuscript, performed morphometrical analysis. MY Writing of the manuscript and performing morphometrical analysis. SAA Histological diagnosis, writing, revising and editing of manuscript. GI and HH Histological diagnosis and writing of the manuscript. APM Data analysis, interpretation of statistical data and writing of the manuscript. MK histological diagnosis. All authors read and approved the final manuscript.